Join us, the Bull Kelp Surfers, as we bravely penetrate music's creepy crust to reveal the hot molten reverb drenched core within! Poisonous drum gases release and ferocious bass beasts abound as we navigate the erupting crimson sax-cano and deep drilling guitar-bots Benson-1 and Fez-2. Lookout!! !..it's surf-vival of the fittest down here ! 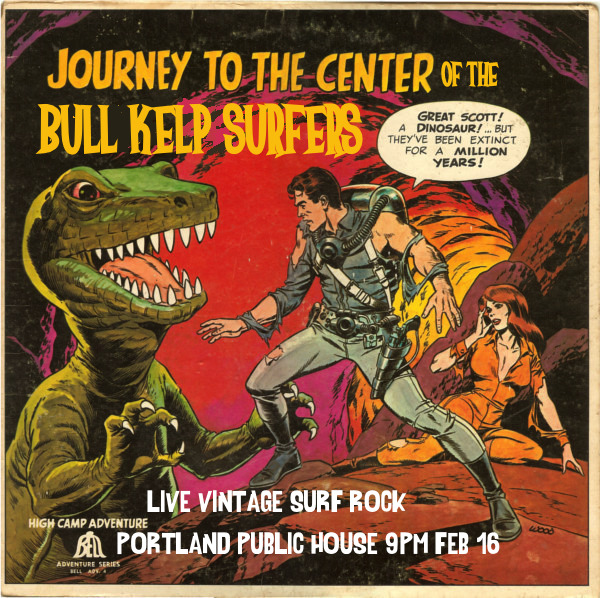 The Bull Kelp Surfers are a 5-piece vintage surf rock band hailing from the wild West Coast of Auckland. Reverb drenched guitars, ripping tenor sax, thundering basslines and crashing drum breaks! More live vintage surf rock than you can shake a Quentin Tarantino at!